The Data Connect low speed IGV23 Industrial Grade ITU-V23 modem is designed and manufactured for rugged industrial communication networks. The IGV23 delivers cost effective and reliable 1200bps asynchronous solutions for point to point and multipoint connectivity.The IGV23 Industrial Grade ITU-V23 modem is ideal for industrial communication applications including SCADA systems,RTUs, traffic monitor and control, and industrial and automation networks. The IGV23 supports RTUs with switch selectable settings and no AT command set required. The IGV23 modem is designed to operate over 4-wire full duplex or 2-wire half duplex over unconditioned leased lines or private metallic circuits. For optimum performance, the modem employs FSK modulations to be compatible with ITU-V23 standards, which can communicate over a variety of transmission lines.The IGV23 Industrial Grade ITU-V23 modem can operate over a wide range of AC or DC power supply voltages and temperatures. With proven reliability and ease of installation the IGV23 is ideal for point-to-point and point-to-multipoint polling networks, where reliability and low-network latency are critical for system performance. With its Auto-RTS mode, the modem can support DTE/RTUs with 3-wire serial interface (TD, RD, SG) in point-to-point and multi-point polling applications. 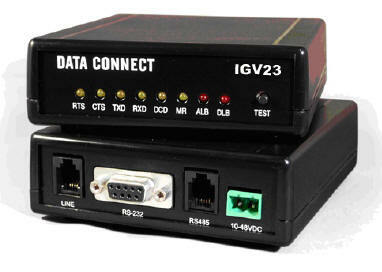 The IGV23 industrial grade ITU-V23 modem has selectable EIA RS-232/V.24 and RS-485 DTE support. It also features built-in diagnostics for local and remote testing.The configuration and options on the IGV23 is provided by DIP switches and jumpers, eliminating the need for an AT command set. The IGV23 has heavy-duty surge protection at the power supply and leased line inputs. IGV23 also uses an isolated DC to DC power converter for protecting critical DC or battery power systems.